Macular degeneration symptoms may first be detected during an eye exam by your eye specialist even before you notice any changes in your vision. Others, especially the senior population, experience the typical symptoms of aging eyes, such as the need for more light, detailed vision is not as sharp, or difficulty distinguishing similar colors. And yet another group of people may have one eye with severe vision loss, but don't notice it because the good eye masks the symptoms of the "bad eye." Signs of macular degeneration that your ophthalmologist may find during a routine eye exam are macular drusen and/or swelling or discoloration in the retinal pigment epithelium - a layer of the retina. One of the first signs of macular degeneration are drusen. Drusen are yellow or off-white deposits in the macula that are often found in those who are 60 and older. Alone, they do not cause vision loss. However, an increase in the size and number of macular drusen does increase your risk for age-related macular degeneration (AMD). Here is a picture of drusen deposits from the National Eye Institute. 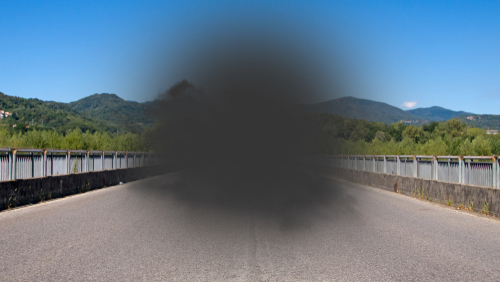 One of the most common macular degeneration symptoms is that normally straight lines or objects appear wavy or bent like this picture from the National Eye Institute. You may have heard of a macular degeneration grid or an Amsler grid. 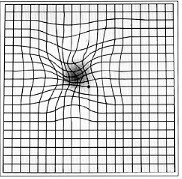 The Amsler Grid, is a grid of horizontal and vertical lines used to monitor a person's vision. If you notice that any of the straight lines look like wavy lines, contact your ophthalmologist. It may indicate a problem with your retina, particularly the macula, the center of the retina. Blurred vision is an early symptom of macular degeneration. 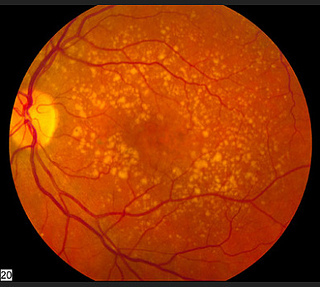 Age related macular degeneration develops when photorecptor cells, like our rods and cones, start to die because they are not getting the nutrient and oxygen rich blood that they need. In addition waste material is building up which is also causing damage. The macula lutea is a tiny spot in the center of the retina. It is responsible for giving us sharp, clear and detailed vision. Blurry vision develops when the cells in the macula are damaged or start to die. 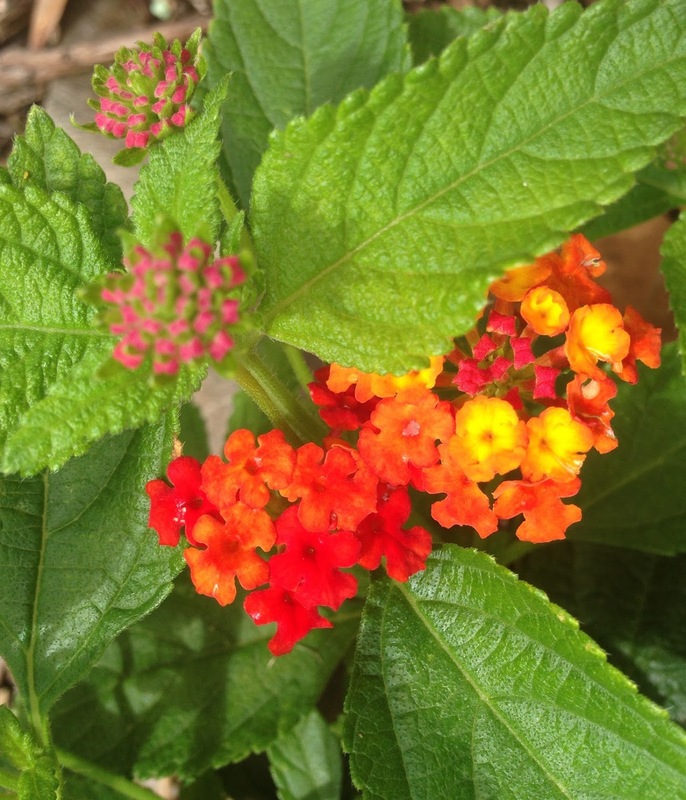 Color vision is also affected and become dulls and less vivid. The loss of sharp, detailed vision makes it more difficult to distinguish words in a book or to recognize faces. A central scotoma is when a dark or blank spot appears in the central portion of your vision while the side or peripheral vision remains close to normal. Macular degeneration symptoms develop when there is eye degeneration to the macula lutea - a tiny spot in the back of the retina. The macula lutea is responsible for our central vision. As macular degeneration progresses the photoreceptor cells, especially the cone cells, often die because of problems with getting oxygen and nutrients to the cells and waste products building up. A person who has dry or wet age related macular degeneration will find it hard to distinguish colors. It becomes difficult to match the navy blue socks and black socks that are in the same laundry pile or to see a white car on a gray or snowy day. Colors are also less vivid and become muted. 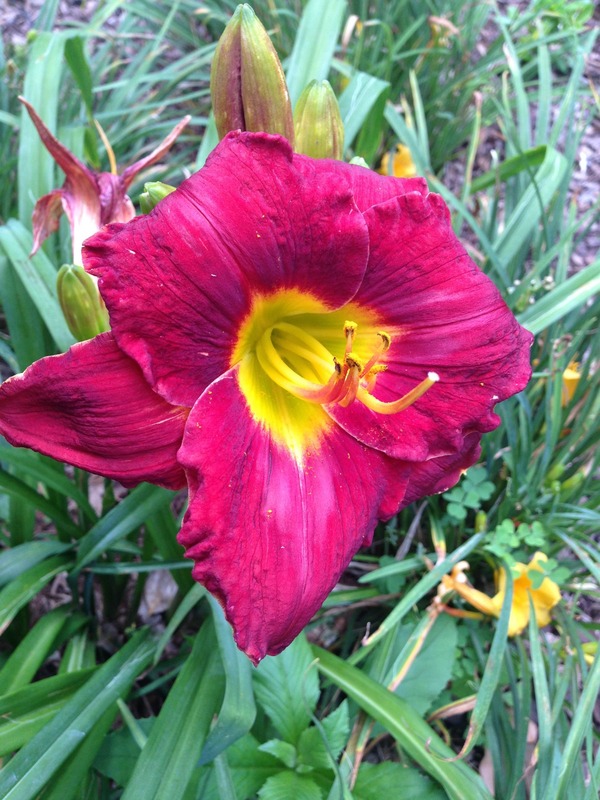 The color intensity and brightness of red flower blossoms, green grass or a pretty scarf can't be appreciated as much compared to someone with healthy vision. Whether it is inside or outside, one of the symptoms of macular degeneration is that a person is really sensitive to bright lights. Some patients describe it as almost painful. According to the Macular Foundation, "The scars in the eyes act as a mirror reflecting light internally within the eye. This causes light sensitivity and glare as well as haziness in the vision." My father-in-law who has wet and dry AMD, finds it difficult and slow to adjust from being outside in the bright light to inside light. This ability to recover from bright light is now being tested as an early sign of macular degeneration. Because depth perception requires two eyes with healthy vision, loss of depth perception is often another early sign of AMD. It becomes difficult to identify how high or low a step is. That is why you will see low vision specialists who comes to the home, pay special attention to steps and how they are lighted and marked. Inside steps should be well lit while outside steps may have a bright yellow strip of tape across them to aid a person in safely navigating them. 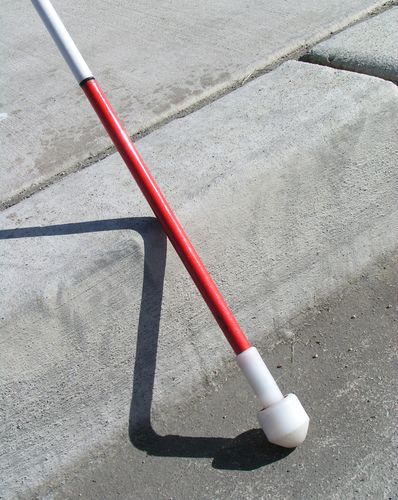 The use of a white cane also serves to help navigate curbs, steps and dips or holes on sidewalks. Distance vision or perception is also altered and it can be difficult to tell how far away an object is. A friend of mine whose 96 year old mother has macular degeneration called me one day and told me about some unusual symptoms her elderly mother was experiencing. Her mother, who had no history of dementia, was seeing people and things that weren't in the room or anywhere nearby. Unsure if these visual hallucinations were related to her age related macular degeneration, my friend related what was going on to her mother's eye doctor. Not being familiar with Charles Bonnet Syndrome, the eye doctor told her that "seeing things that are not there" was not related to her AMD. I don't know how many times I've read that macular degeneration is the leading cause of blindness among seniors - it is not blindness, loss of vision yes, but not blindness. One still has side or peripheral vision. However, people with advanced macular degeneration often fit the description for "legally blind." Legal blindness does not mean that a person is blind but rather it is a standard of measurement that determines a person's eligibility for government benefits. 2) a visual field of less than 20 degrees. A person with vision of 20/200 has to be as close as 20 feet to identify objects that people with normal vision can spot from 200 feet. People who meet the above criteria still may have usable vision. However, they would need low vision or magnification devices in order to read and they would not be able to obtain a driver's license. A person who is legally blind may also be eligible for government aid and tax benefits. Macular degeneration symptoms are usually not associated with any eye pain or discomfort, so you will not feel any changes. If a person has AMD in one eye and not the other, the good eye often compensates for any vision loss or distortion. Without regular eye exams, the change in vision may not be noticed until the second eye becomes affected. a blank or empty spot, notify your ophthalmologist immediately. Macular degeneration symptoms are similar to many of the vision changes that are associated with aging, which is why it is important to have regular eye exams. 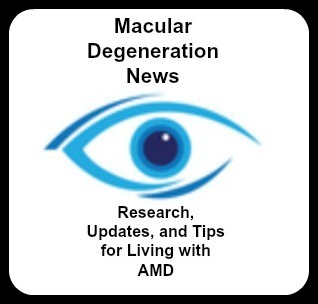 To raise awareness of AMD, the Macular Degeneration Partnership (MDP) is distributing a public service announcement (PSA) nationwide. Seen through the eyes of a woman with AMD, the “One Focus” PSA reveals the challenges of vision loss, where “With AMD, even a walk in the park is no walk in the park”. Macular Degeneration Partnership Can Help with AMD from Macular Degeneration Partnership on Vimeo.